In this day and age, we all realize how important reviews are. How many of us read the consumer reviews before purchasing something on Amazon or another retailer’s website? Or at least take a quick glance at how many overall stars consumers gave the product in their reviews. Same thing with travel and host travel agencies, right? Many consumers spend hours on Trip Advisor or other travel review websites, reading what prior travelers had to say about that particular hotel or destination. We actively maintain our company profile at Host Travel Agency Reviews, where our former and existing independent travel advisors can review Andavo Travel as a host agency. As of today, we are proud to say that we have 5 out of 5 stars and 32 positive reviews from our network of luxury travel advisors! 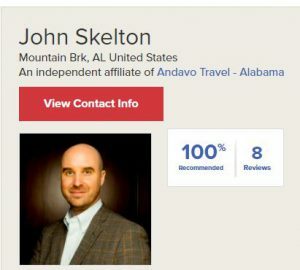 Our travel advisors have the opportunity to create a profile on our Andavo Travel vacations/consumer website, where they can include testimonials from past happy clients. Click here for an example. Our advisors can also have a profile on Virtuoso’s website, and opt in to Virtuoso’s Reviews & Recommendations program, where Virtuoso directly emails their clients after they return from a trip, giving them the opportunity to review their travel advisor’s services. Those reviews are then added to that advisor’s website profile. Click here for an example. We strive to be as transparent as possible, so that travel advisors looking for a host agency can feel confident in their choice, and consumers looking for a luxury travel advisor can feel similarly confident in their choice. We invite you to take a look at our reviews and decide for yourself!